This year Christmas lunch was at my house. Normally we always go to my parents house, but this year it was my turn. So when thinking of what dessert I wanted to make, I decided to do an ice cream based dessert as I can never take them to mum's for Christmas as they would melt by the time I got there. 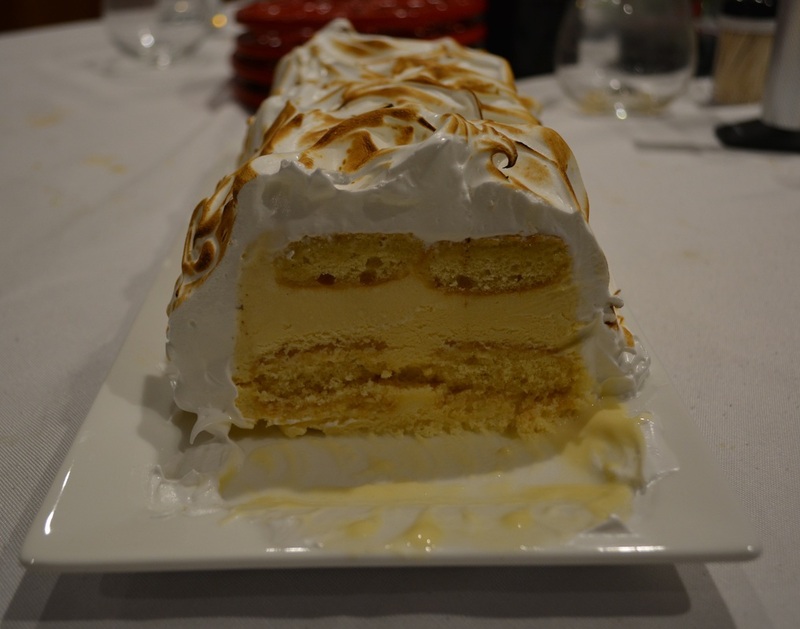 I remembered making this Limoncello Bombe Alaska a few years ago for friends and knew it would be amazing. Knowing my mum loves Limoncello I thought it would be the perfect finish to Christmas Lunch and it was. This is delicious. This looks spectacular. This is amazing. The ice cream base can be made days ahead (which is always a good thing when you are making lunch for people) and the meringue just needs to be made near to serving, but it is so simple to make that you won't stress at all. I used store bought lemon curd this time, but if you want to make your own do so, I just ran out of time. I also used large sponge finger biscuits (as I could not find the small ones) and needed only 10 of them. And I do like Blue Ribbon Vanilla ice cream for this as it is one of my favourite ice creams and is not ridiculously expensive. Limoncello is a lemon flavoured liqueur, buy the best one you can afford. Please buy yourself a cooking blowtorch, it is something once you buy it, you will be making all sorts of desserts and you will love it. 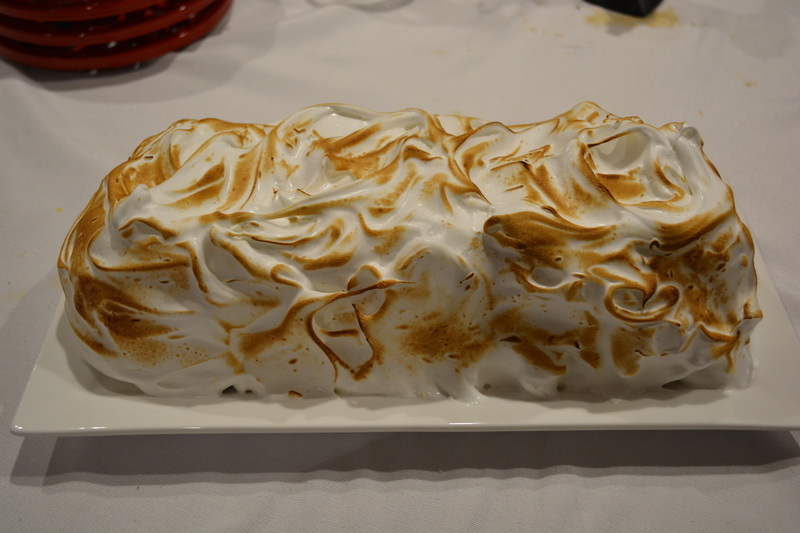 If you don't have one, you can place the meringue covered bombe Alaska in a preheated hot grill for 1 minute or until golden. 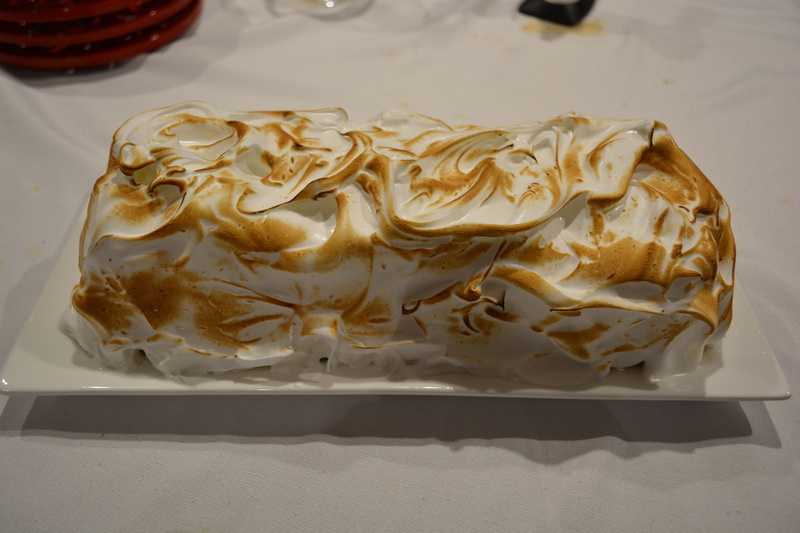 I blowtorched the meringue at the table and my guests loved it. The aroma of the meringue while being blowtorched is amazing, my guests couldn't wait to try it. And the biggest compliment I can ever get, my mum wanted seconds. I know I did well when she wants seconds. She even said I need to make it for New Years Eve when we party all over again. This cool lemon ice cream dessert is the perfect balance between sweet and tart, it is light and refreshing, you really do need to try it. Heat the Limoncello and sugar in a small saucepan over a low heat, cook, stirring until the sugar dissolves. Bring to the boil and cook for 1 minute. Remove from heat and set aside to cool completely. For this recipe you will need a 32cm x 7.5cm x 8cm loaf tin. Cut two sheets of cling film larger than the loaf tin, and place one on top of the other, then use the cling film to line the loaf tin, the cling film must come up the sides and hang over the tin so you can easily remove the ice cream when needed. Dip the biscuits in the cooled Limoncello syrup and place side by side in the base of your prepared tin. Cover the whole base with the biscuits. Remove the ice cream from the freezer and leave to stand for 10-15 minutes to begin to soften. Scoop out the ice cream into a large bowl, mash it up, but make sure it remains thick and fluffy (don't allow it to melt too much). Add the lemon curd to the bowl and fold it through the ice cream until it is just combined. Place half of the ice cream on top of the biscuits in your loaf tin, smooth out the surface. Dip the remaining biscuits in the Limoncello and place on top of the ice cream, side by side. Top biscuits with the remaining ice cream, smooth out the surface. Just before serving, make the meringue. Place the eggwhites in the bowl of an electric mixer (you can use a hand held one) and beat until soft peaks form. Add the sugar a tablespoon at a time until the mixture is thick and glossy. Add the vinegar, beat until combined. Once the meringue is ready, quickly, but carefully invert the ice cream onto a serving plate. Using a palette knife (or a spoon) cover the top and sides of the ice cream with the meringue (I find it easier if you put the meringue on top, then spread it down the sides). Using a blow torch carefully torch the meringue until golden. Serve immediately before it melts.